My dad was a gun nut, which doesn't give me any special insight, perhaps, but it's not going to stop me from shooting my mouth off. And to open with an aside, what does it mean so many of our metaphors are rooted in violence? We attack problems when it's a war out there, fighting tooth and nail, hoping things don't blow up in our faces or that we get hoisted on our own petard, a phrase fine enough for Shakespeare. Forget a coarsened culture, we might be, at heart, ever trying to back away from the cave of our nasty, brutish, and short selves. Perhaps that we aren't even more violent is the wonder, and why so many great artists, walking on a precipice high above us with better views, so often topple into misanthropy. The more you look, really look, at us, the less you like. Well, and then there's my dear dead dad. I've joked the greatest disappointment in his life was that he never got to shoot an intruder who broke into his house, but in light of the NRA's clenching of its warm twitchy fingers on its guns in the wake of Newtown, maybe it's not a joke. And it's abysmally not a joke in the slightest that my gun-owning brother-in-law used one of his to blow his brains out in the basement one day. Happy Good Friday, to my sister, coming home to find that. So guns--it's pretty easy not to be ambivalent. As for rising up to prevent tyranny--seriously? Even if you're armed to your teeth, methinks the government has more means to do away with you than you could imagine. Ask Anwar al-Aulaqi and his son. And sure, they were al-Qaeda and deserved it but they were US citizens and we've got some other constitutional rights no matter how bad we are--like the right to trial. But now is not the time to drone on. It must be tough living atop firepower mountain with only slippery slopes as far as the eye can see. No amendment seems more fragile than the second--any hint of a limit to what an individual can do as far as gun owning and the whole right seems to crumble. Yet somehow freedom of speech can exist beside libel laws. And while you can't yell fire in a crowded theater, we seem stuck having to protect someone firing in a crowded theater because, well, you tell me, Wayne LaPierre. And then there's the land of false equivalencies, the bit about how a car is more dangerous than a gun. Except few people use them intentionally as weapons (David Attias aside; note a car as weapon could manage to be a joke in Manhattan--"the car lurched"--but if Woody/Isaac said "I didn't know it was loaded" that's it for both Meryl Streep's character and humor). Plus what would be the gun equivalent of drunk driving checkpoints? Maybe, oh, stronger background checks? Perhaps what's good for the drunk is good for the shooter. We live in a society full of controls and limits, and a few on guns won't hurt. In fact, that's the very point. As he snorted the second line of blow off Minnie Mouse’s derriere, Josh Hamilton knew everyone was right. Every last one of those blog commenters. This Anaheim of Los Angeles lifestyle was going to, is going to, well, tenses just seemed confusing now. But this was something different. Cavorting with Dallas Cowboy cheerleaders was one thing – and you could marry one of them like Greinke did. Even they, America’s sweethearts since the 1970s when every cut to NFL commercial featured their pearly whites and perhaps a bit of something more, well they’d been sullied by Debbie Does Dallas. Josh just knew Arte wasn’t going to be pleased if there was a DH Does Disney (“hey batter, hey batter, hey batter – schwing!”) movie someday. So you can fire up the porch heater when you're dining outside on a chilly (it does too get chilly) December southern California evening, or you can order one of these beauties and get toasted from the inside out. I've got a weakness for Russian Imperial Stouts, which are to Guinness what Thomas Keller is to Guy Fieri, except: 1) it's no fun drinking Thomas Keller, and 2) if the occasion is right, and the need for something light in weight if dark in color called for, a Guinness is ok. Fieri never is. But North Coast's Old Rasputin is one of my two impeachables (along with Pliny the Elder); Stone's IRS always rocks (and I embrace that cliche and pun for all its worth); and then there's Ballast Point's Sea Monster, Oskar Blues' Ten Fiddy, Port's Little Santa's Helper. It's a deep dark list of wonderfulness. 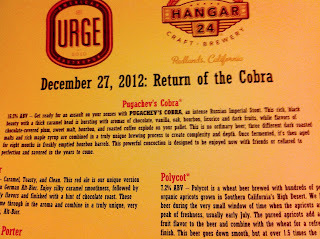 So, of course, I had to take a shot at pulling off a Pugachev's Cobra. 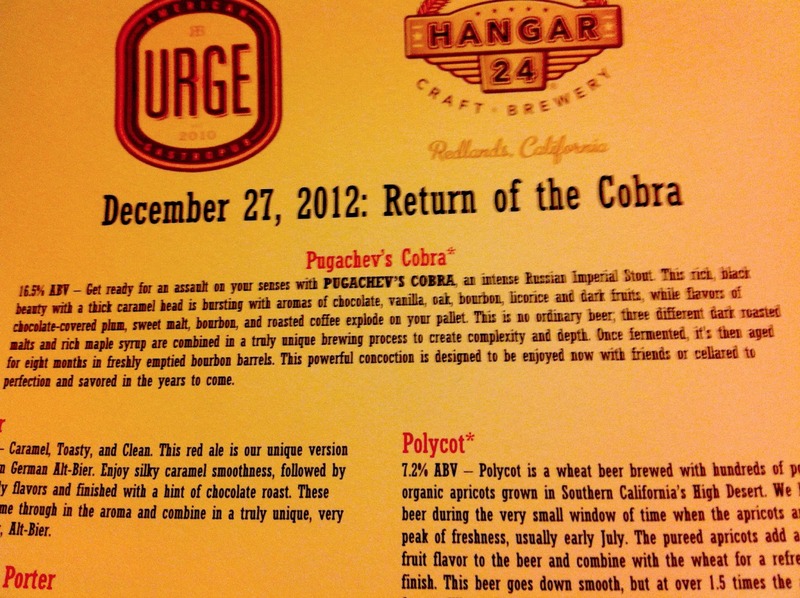 It seems in aviation, and remember that brewery's name is Hangar 24, if you can emulate test pilot Pugachev, who could maintain elevation while pulling the nose of his plane straight up, so the jet would appear a flying "I" in the sky, you've completed a Pugachev's Cobra. Keeping your elevation while downing one of these, or I should say sipping, which you'll do not just because it's 16.5% alcohol, but because it's a non-stealth-bomber of flavors, isn't easy. But it's worth a shot. For it doesn't taste that hot, not on tap, at least, where its creamy mouthfeel keeps you from the burn--there's barely an alcohol spank at the back of the throat when done. Instead it's coffee and caramel and vanilla, and there's no doubt a bunch of that bourbon barrel has imparted its ways on the ale. If there was ever a gustatory reason to attempt something like an Irish Car Bomb, it would be an excuse to drink one of these, a mix of liquor and beer that isn't just meant to turn your cerebral cortex into slurry. A challenge beer, yes, but one with surprising finesse.